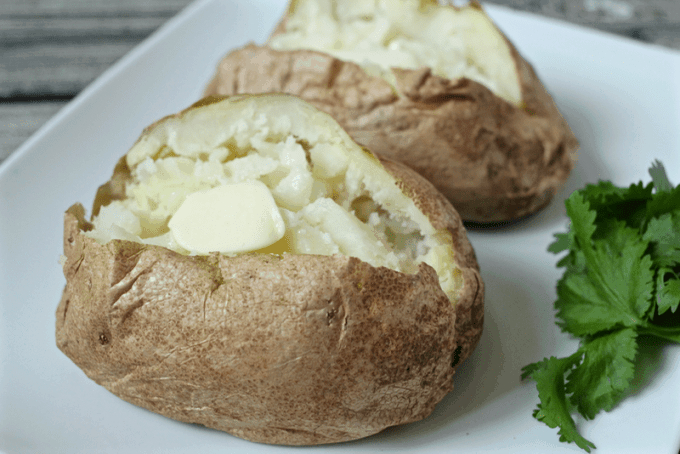 Microwave baked potatoes come out perfectly fluffy and tender every time – and only take about 10 minutes! I was well past college, well into my adult years before I ever realized that not everyone made potatoes this way. Which is perfect because who has time to heat up an oven and let a couple of potatoes roast for an hour?! Potatoes are a great pairing for so many dinners. Or they can be the main event at dinner, as in my cheesy chicken and broccoli baked potatoes or chicken hash over baked potatoes. 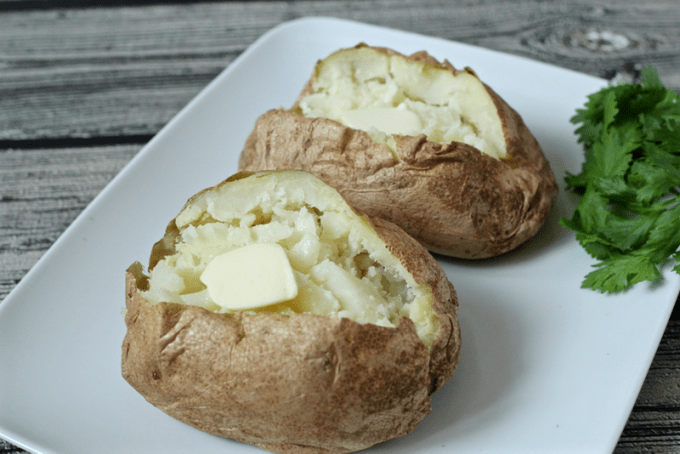 Plus, everyone can fix and top their microwave baked potato just as they please, so they work well for families with different tastes (aka picky eaters). Scrub the potatoes and poke each potato 5-6 times with a fork – I do it a few times on each side. Place potatoes directly onto the microwave plate. The time depends on the number of potatoes and the size of your potatoes. For 2 medium-sized potatoes, start with 10-11 minutes of microwave time. If you have 4 potatoes, start with 15-16 minutes. For just 1 potato, start with 5-6 minutes. When the time is up, get a towel or oven mitt and gently squeeze the sides of the potato. If it gives without resistance and starts to open up, it’s ready. If it still seems a bit firm, microwave for another minute at a time until tender. If your potatoes are different sizes, remove the ones that are tender and continue cooking only the ones that need additional time. 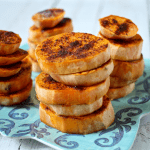 Carefully cut open your potato, add your favorite toppings and enjoy! 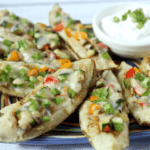 Some topping ideas include: butter, sour cream or Greek yogurt, shredded cheddar cheese, crumbled blue cheese or feta or goat cheese, crumbled cooked bacon, chives or fresh herbs, guacamole, salsa – so many possibilities! 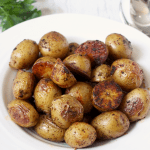 Any way you serve them, I love that potatoes are perfectly portion controlled. I tend to get a bit crazy when piling pasta or rice on my plate, but a potato? The whole thing is mine. 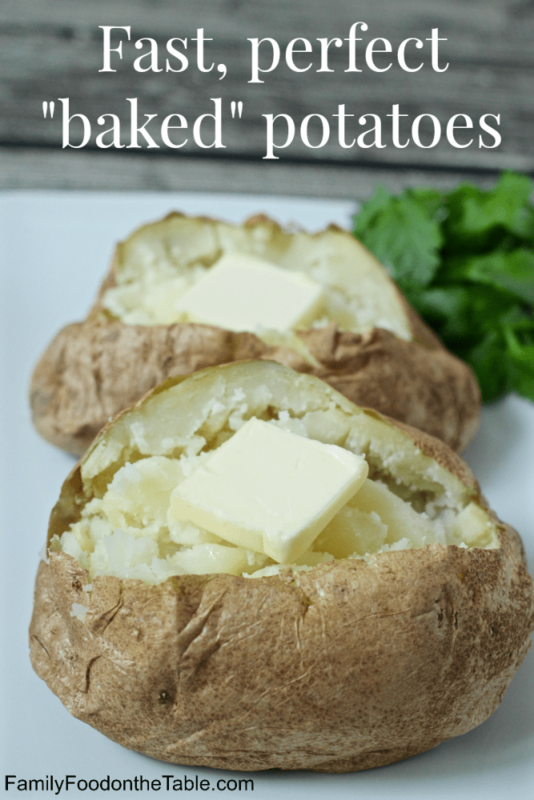 I hope you give these a try – they make dinner so easy and you end up with perfect, fast microwave “baked” potatoes every time. P.S. 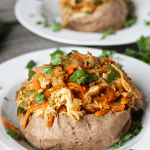 You can sign up for my free e-newsletter and get my free e-cookbook with 10 easy weeknight dinners! 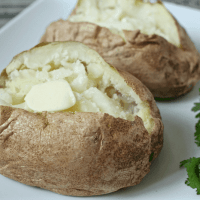 These "baked" potatoes come out perfectly fluffy and tender every time! Salt and pepper, butter, Greek yogurt or sour cream, shredded cheese, crumbled bacon, green onions - whatever you like! Scrub the potatoes. Poke each potato 5-6 times with a fork - I do it a few times on each side. Place potatoes directly onto the microwave plate. Microwave on high. The time depends on the number of potatoes and the size of your potatoes. See notes. For 1 medium-sized potato, start with 5-6 minutes. When the time is up, get a towel or oven mitt and gently squeeze the sides of the potato. If it gives without resistance and starts to open up, it's ready. If it still seems a bit firm, microwave for another minute at a time until tender. For 2 medium-sized potatoes, start with 10-11 minutes microwave time. Do the squeeze test and then add a minute or two as needed, until tender. For 4 potatoes, start with 15-16 minutes in the microwave. Do the squeeze test and add another minute or two as needed. Want to make it a meal? 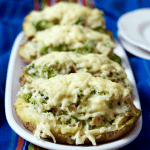 Try my fast cheesy chicken and broccoli twice-baked potatoes – an all-in-one meal that everyone will love! How high can YOU stuff them?! Yikes! I wouldn’t put anything in the microwave for 35 minutes! I’ve made this hundreds of times and for 2 small to medium potatoes, 10-11 minutes is all I need. Even with 4 medium to large potatoes, they’re usually all done in 15 minutes. Sorry yours didn’t work out – not sure what happened there. I thought/wondered that too Tonya! That’s a pretty major difference, but could be the issue. 1000 watt or higher will cook any potato in 8 minutes. Excellent info – thanks James! I just keep them in for 4 minutes. I use LARGE( almost a pound each) potatoes, 4 minutes then turn potato over, 4 minutes more, leave in microwave another minute or so, perfect. 1250 watt Panasonic. I LOVE a big potato too 😊 Thanks for the info James – that’s helpful! Worked perfect! Did 2 medium potatoes and one little one (for my 2 year old) 10 minutes and done! Thanks for posting! I do this too but I wrap each potato in a damp paper towel. Keeps them from drying out! Great tip Deborah! I’ve never felt like my potatoes dried out, but I’m gonna try this next time just to see! I’ve done potatoes in the microwave, the oven, and the crockpot. I’ve even cut them in half lengthway and baked them in a toaster oven. I’ve baked red potatoes and white potatoes. I’ve baked them wrapped in foil and not wrapped. Baking in the oven, wrapped or unwrapped, is the only way to get the fluffy texture, we all love. Sounds like you are a potato lover like me! I do adore a baked potato in the oven, but I also really love the microwave version and mine always turn out so tender and fluffy – plus it saves me so much time! I keep trying to cook a baked potato in the microwave but the center of my potato always comes out hard, even if it’s hot. I don’t know if I am cooking it to long or to short I have tried both ways. It sounds to me like your microwave is either too low, or you aren’t cooking it long enough. Either way, I’d advise cooking a couple of minutes, then allowing the part of the potato that was actually heated (about a centimeter to an inch in) to heat up the middle for about a minute. Simply repeat till your potato is done. I hope this solves your problem. 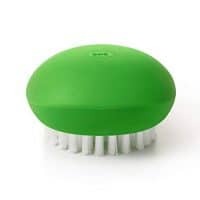 Scrub it very thoroughly, let it get wet; take a big gob of butter and rub it in thoroughly; do NOT EVER poke it!! 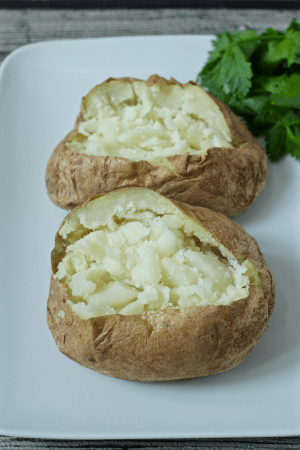 (drys it out); wrap it in about 18″ WAX paper, yes a long piece so you can roll it; twist the ends hard, then microwave according to size and number of potatoes. Moist moist moist!! I microwave potatoes bake them in the oven, in foil on the grill, but the microwave always works best. If I have several to cook like last weekend I wrap them in saran wrap after washing and poking holes and rubbing a little olive oil on each one. Microwane on high for 10 min and let sit then put the stakes on with indirect heat after turning the stakes at 10 min I start the potatoes again for another 10 min. And let sit until I sear the steaks on hi heat. I let them rest on a tented tray in their juices for 5 min while everyone prepares their own potatoes to tast some even use the ashu from the steak in place of butter. Cooking times always very because of size potato wattage of microwave and sometimes barometric pressure meaning your altitude. Bon appétit! Ah, steaks and potatoes – such a classic combo! 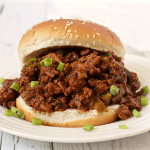 Love that you have the timing down so well – sounds like a great dinner! I had to scroll a long, long time and read 5 ads to read “put in microwave”. Haha. Nice one! Mic drop! Hi, would you happen to know how many watts your microwave is? My current microwave is 1200 watts. My last one was 1000 and it was about the same timing for potatoes. Hope that helps! Kathryn, what a gorgeous idea! We absolutely love potatoes! Definitely need to try these! Kathryn, nice idea! 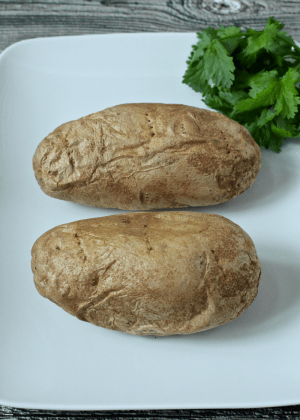 This potatoes look absolutely delicious! I need to try it! Thanks Alina! I hope you love them!